The Atlantic City Convention Center now has the largest single-site roof-mounted solar array in North America, but the installation involved an all-out effort to meet the deadline for the investment tax credit-and everyone delivered on their commitments. The convention centre authority decided to go with a power purchase agreement with the solar power project, where it would provide the roof space but another company-in this case, Pepco Energy Services-would own, operate and maintain the PV system. Atlantic City, which has been dubbed the Las Vegas of the East, is well known for its beach boardwalk and gambling casinos. But with the installation of a 2.36-megawatt photovoltaic solar power system atop the convention center in late 2008, the city on the Atlantic shore is quickly growing into an alternative energy center. "People are starting to look to the area as more than just gambling and the boardwalk," says Janet Mitrocsak, convention center director of facilities. Atlantic Wind Farm in the March/April 2007 issue of enerG Magazine at www.altenerG.com). 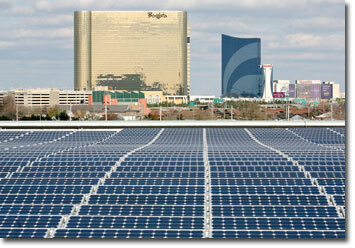 The convention center's 13,486-panel system is also the largest single-site roof-mounted solar array in North America. Bringing it online towards the end of this past December was an equally grand feat. Heading into the project, Mitrocsak explains, the U.S. Congress had failed to renew the federal investment tax credit. That meant the credit would have expired on December 31, 2008. The credit has since been renewed, but not before the work schedules and a December 31 completion deadline for the convention center project had been set and work was in progress. She credited Arlington, Virginia-based Pepco Energy Services, which owns and operates the system, and American Capital Energy, which acted as the general contractor, for the on-time, on-budget performance. "For a project of this magnitude, I've never had such a cooperative contractor," Mitrocsak says. "They produced a construction schedule, and they literally made the schedule to the day." In the process, 74 electricians set a record and installed 1,200 panels during one day. Paul Trego, project manager for Pepco Energy Services, credits the job's outcome to "a lot of hard work." "The electricians just really did a great job," he says of Washington Township-based Ray Angelini Inc. "We had good manpower and good coordination. The fact that when we started, the investment tax credit was set to expire on December 31 meant we had an objective and commitment to our customer to have it operational by December 31. We got all of our final sign-offs and turned on the system on December 29." Preliminary work on the project began about 18 months ago when the Atlantic City Convention Center & Visitors Authority conducted a feasibility study into possibly installing a PV system for power generation. The authority, which manages the convention center, had already implemented an environmental initiative, which included recycling and energy savings retrofits. "This was just the next logical step," Mitrocsak says. The consultant hired for the feasibility study looked at both thin-film technology and monocrystalline PV panels and recommended monocrystalline. The consultant also considered the roof load presented by the different technologies and the types of mounting options-whether to go with roof penetrations or no penetrations and a series of ballast and weights. The solar panels cover about 290,000 square feet of the roof top and are mounted at a fixed 10-degree tilt, the most cost-effective perspective. Based on the roof size, system size and other factors, he said the panels would produce enough power to meet about 16 percent of the convention center's electricity needs. "That was good enough for us to go out to bid," Mitrocsak says. Pepco Energy Services, a subsidiary of Pepco Holdings Inc., was awarded the bid and subsequently selected American Capital Energy, a full-service solar integrator, to design, engineer, manage and install the solar array. As part of the solar installation bid, Mitrocsak says the authority asked for replacing the roof under the panels with a standard bituminous coating. Pepco recommended a white TPO (thermoplastic polyolefin) membrane material, partly because of its energy enhancement features. "We wanted the white roof because it will reflect more sunlight, and it will keep the panels cooler during the summer," Trego says. And cooler panels operate more efficiently. For the same price, the convention center had a new 500,000-square-foot white roof compared with what a partial 300,000-square-foot bituminous roof would have cost, Mitrocsak says. An added attraction was the curing time for the white material was a fraction of that for the darker coating. The assembly of the SunLink track mounting system began in September 2008. Tom Hunton, president and chief executive officer of Massachusetts-based American Capital Energy, says they decided to go with the SunLink system after weighing the advantages of strategic roof penetrations against no penetrations at all. Since Atlantic City sits on the Atlantic Ocean and occasionally experiences hurricanes, the structure had to withstand 115 mph winds. In the end, they decided to go with strategic penetrations. "The ballast and weight just weren't worth it to hold it on the roof with no penetrations," Hunton says. "It just didn't make any sense. A lot of the jobs we do will have no penetrations. But when you're 60 feet off the ground and right on the ocean, it's a lot more difficult to do." The mountings involved about 1,476 penetrations. Trina Solar Limited provided the 13,468 panels-a first for the Changzhou, China-based company. Although Trina had supplied panels to about 100 MW worth of projects in Europe and China, it did not have a presence in the United States. Hunton says he had full faith in the company because of American Capital Energy's knowledge of the furnaces used to make the solar wafers. "We inspect their factories," he says. "We looked at the quality and the conditions of the workers. 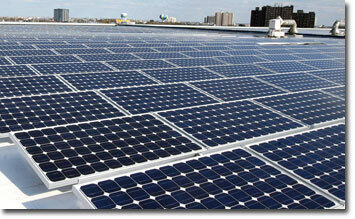 The fact is solar panels are almost all the same today." With a tight deadline on the convention centre project, 74 electricians set a record and installed 1,200 panels during one day. The project has a total of 13,486 panels, from Trina Solar. At the time the Atlantic City project was seeking panels, they were in short supply worldwide, and Trina had them available. "You just couldn't find a panel anywhere. Germany was taking a lot," Hunton says. "Spain had recently started a very aggressive solar program as well, so panels were all going to Europe. "When we were working our contacts, we asked, 'How are we going to find 2.5 MW within two months' notice, and how are we going to do it on budget and on time?'" The panels cover about 290,000 square feet of the roof top and are mounted at a fixed 10-degree tilt, which is the most cost-effective perspective, Hunton says. "On the ocean, you always have to consider the wind rating on them," he says. "When you go from flat to 10 degrees, you pick up a big chunk of power. When you go from 10 to 20 degrees, you maybe pick up another three percent, so it's diminishing returns." The panels generate the power, then send it as DC current through four 500-kilowatt Satcon inverters for conversion to AC. The PV system is rated at 2 MW AC "when the sun is shining bright on a cool day with the sun high in the sky," Hunton says. 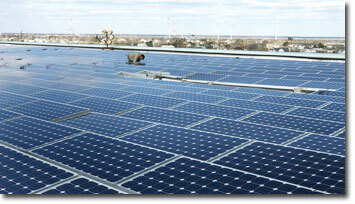 Energy Services-would own, operate and maintain the PV system. "The capital outlay was just so much that we wouldn't have been able to pay for it out of our capital projects," Mitrocsak says. "The typical payback on these types of projects is five to seven years. In terms of capital projects, usually the authority doesn't like to see projects that have more than a 2 ½-year payback." Pepco is also able to take advantage of the federal investment tax credit, something the convention authority-as a quasi-governmental entity-wouldn't have been able to. Because Pepco owns the solar array that will be producing renewable energy, it qualifies for a $245,000 rebate under the New Jersey Clean Energy Program. In return, the convention authority receives a 20-year power contract at favorable rates that is expected to save it about $4.4 million, she says. Although the solar array has only been generating power for a few months, those involved are pleased with the performance. From what they had seen early in its operation -and they've been collecting weekly data-it looks like the system was hitting or exceeding anticipated energy production numbers. The system is expected to generate about 2.8 million kWh annually. Hunton says he's confident the system will generate as predicted since they were able to use local weather information from a National Oceanic and Atmospheric Administration station in Atlantic City. Pepco's choice of the highly efficient Trina panels and the white roof also means the array will generate about 26 percent of the convention center's electricity needs, compared with the 16 percent contained in thefeasibility study. As part of that feasibility study, the convention authority also looked at rooftop solar arrays for other buildings, and Mitrocsak says those haven't been ruled out. The Atlantic City Rail Terminal, adjacent to the new convention center, has a canopy roof that could provide a venue for a smaller-scale solar project. "Maybe not now, but if solar technology gets more efficient and cost-effective, it might be worthwhile at some point in the future to do the roof because they are south-facing roofs," she says. The authority is also looking at the historical Boardwalk Hall, which used to host the Miss America pageants, and the adjacent West Hall, which is used for storage and parking. "The big concern over there is there's some talk of a taller skyscraper-type structure adjacent to those buildings," Mitrocsak says. "If that is the case, we could incur all sorts of shading problems. We need to pay attention to what the developers are doing around us."